In this article, let’s chat about how to find the perfect wedding ring to match your engagement ring. Hint: Blue Nile has the perfect tool that I recommend you check out – More about that down below. The anticipation and buildup to the moment that you get to slip that lovely rock onto your finger for the first time is over. The wait may have been a long one, but who cares. You’re part of the recently engaged club, and a brilliant ring is proof of that! In reality, many guys may not realize that a woman actually gets two rings, not just the big rock engagement ring that we all fantasize over. Once you firmly affix your engagement ring on your finger, don’t forget to plan the purchase of matching wedding bands. It can be an arduous task to find a matching wedding band for your engagement ring. You scour the mall meandering among jewelry stores, sliding rings on and off your finger in hopes that your wedding band will magically appear. In frustration and annoyance, you manage to finally just choose one. 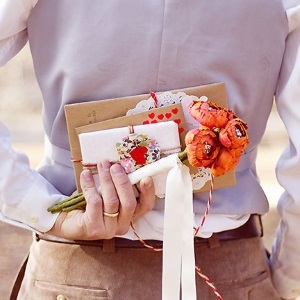 You could keep trying on rings all day, but you have to get home to plan the rest of your wedding. And, you aren’t the type that likes to take too much of the sales staff time at the jewelry store. Similar to buying an engagement ring, don’t rush the decision to purchase a matching wedding band. These two rings will be your staple jewellery to wear, admire, and reminisce over for many years to come — you’ll want to love your wedding ring set for a long time! With that in mind, here are some tips for finding the perfect wedding band. Set a Budget: It is tempting to enter a jewelry store and be enticed by all the diamonds shining back at you, that you just look past the price tag. Our suggestion is to set a budget long before stepping into the shop, or even work with the jeweler to show you what is in your price range before the other rings start calling you over like sirens of the sea. Just remember that the more karats the higher the price, and any extras like diamonds, detailing, or engraving will add even more. 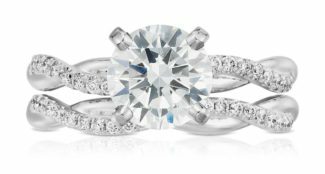 Buy the Bridal Set Together: Some jewelry stores offer matching bridal sets, which include the engagement ring and wedding band together. And just as you were both made for each other, so where these two rings. Bridal sets make choosing matching wedding rings very easy. Matchy-Matchy Traditions: In the past, many couples chose matching metal band sets as an expression that they had become one and that they belonged together. Well, I am all about out with the old and in with the new! There is no rule saying you need to choose matching metals for your wedding bands, and you are no less married if you do. It is totally a personal preference, and many couples today are choosing the non-traditional route – selecting a wedding band they each love that suits their individual style. 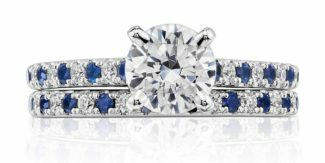 Your Lifestyle and Appropriate Settings: When my husband and I bought my matching engagement ring and wedding band at the jewlery store, I admit I was completely swayed by the lovely multi-diamond bands. Tip for you all: they are not so great for upkeep. Last year, I was coming around a corner in our house and I went one way and my arm somehow decided to not make the turn completely and I ended up smacking my ring pretty hard against the wall. I immediately looked at my ring with sheer horror as I had visions that the diamond would be chipped. Thank goodness everything looked in order, until I got in bed later that night and saw what looked like a black hole. Turns out I did knock one of the smaller diamonds out, (never to be found again, might I add). My lesson to you, especially if you like the multi-diamond band look, if you use your hands a lot, or you are rough with your jewelry, this bands may not be a great option. When I took it back to my jewelry to fix it and clean it, my lovely jeweler proceeded to tell me that the process they use to clean jewelry is a machine that shakes the jewelry up, something like this Ultrasonic jewelry cleaning, and there would be a risk that it might loosen the smaller diamonds. Sshe advised that I not have the ring cleaned professionally. I wasn’t thrilled to find out that she opted to leave that little tid-bit of info out when we were buying the ring. Anyways, lots of diamonds are beautiful, but they are not necessarily practical for everyday wear and tear. Definitely know your lifestyle and know your ring settings before you buy. Try it on: You may like the idea of buying a ring online, but do go to a jewelry store to try different styles on and get a feel first. You may end up surprising yourself and liking a style you never thought you would. Maintenance Matters: Just like a car, the maintenance of fine jewelry is required. Diamond prongs wear down / bend, meaning diamonds will become loose and need regular visits to the jeweler for a ring inspection. Experts suggest 2-3 times a year. Whereas some metals will need to be professionally polished to keep scratches at bay, other metals like white gold will need to be regularly re-plated to keep the beautiful white gold finish. Don’t Wait Until the Last Moment: It can take some time to find the complimentary band to go with your engagement ring. You are best to start your search early (at least 2-3 months in advance of the big day), so that you will have plenty of time to research, browse, and sleep on it for a night or two. This time frame is especially accurate if you decide to go the custom route and engrave any of your rings. Then, most certainly give yourself at least a month to have this service done. Finding the perfect wedding band can feel daunting, especially when there are the options of adding gemstones, diamonds, and choosing between all the available metals types. We think the best thing to do is take it step by step, starting with the style. Are you drawn to a simplistic band or one with some extra bling? Do you want the metal to match your partners? Do you want the wedding band metal to match your engagement ring? After answering some of these questions, you will have eliminated a great deal right of the bat, making your wedding band hunt a little easier. Metals: If your engagement ring is yellow gold, choosing the complimentary matching metal for your wedding band is a good rule to follow. You will sometimes find rings that incorporate both yellow gold and white gold in the design, which is beautiful and perfect for someone who does tend to accessorize by wearing a variety of different jewelry types. Stone Shapes: Most things in life look better with uniformity. If you’re looking for a wedding band that incorporates stones, I recommend pairing similar cut stone to that found in the engagement ring. For example, if your engagement ring is a round solitaire and you would like some more bling in the wedding band, an eternity band with round diamonds would suit your engagement ring beautifully. Stone Colors: If your engagement ring features a colored gemstone, try finding a wedding band that incorporates the same stone color for a good match. Be cognizant of the center stone, as you don’t want the wedding band to take away from or compete with it. 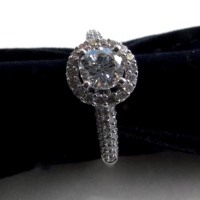 Another option is to alternate diamonds with colored gemstones to balance the ring out. 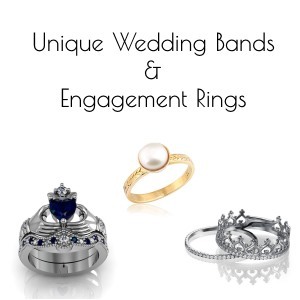 Perfect Match: Perfect matching engagement rings and wedding bands are just that because they were designed together. However, if you choose a band that has the same shape (and in the same metal type), even though they weren’t designed together they still pair well. Complimentary Match: Choose a wedding band that compliments the engagement ring and makes it a set, even though they weren’t made together. Just make sure you choose something that doesn’t take the attention away from the main center diamond. Old vs New: If you have your heart set on your grandmothers engagement ring, it is best to try and find a matching vintage wedding band to go with it. Where as if you are choosing to go with a modern style engagement ring, best stick with a complementary contemporary wedding band. Design style number three from above really caught my eye. When shopping for your band, check out a style that is all diamonds with an engagement band that is made from metal. This creates a very unique look that is becoming more and more popular with brides-to-be. The hunt for your man’s wedding band can be a lot of fun, especially if you leave an element of surprise whereby you make the final selection and choose his ring among a few that he likes. This is exactly what I did for my husband! Engraving his ring with a special message is a great idea – an added touch he’ll love. I engraved my husband’s ring with a special (and quirky) message – a bit of an inside joke for the two of us. My husband and I were fortunate that when we bought my engagement ring it had the matching wedding band. No need to drag him to the mall for hours on end to find a matching band. If you are not as fortunate and your engagement ring doesn’t come with a matching wedding band, that is okay. 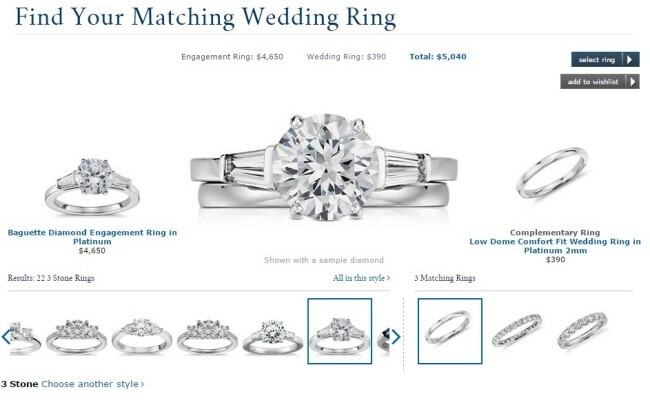 My contacts at Blue Nile alerted me to a great online tool that they developed, which allows you to find the perfect wedding ring to match your engagement ring — even if you didn’t purchase your engagement ring from them. I played with the online tool to choose a similar style engagement ring to my own. I received a few wedding band suggestions to match. You could spend hours playing around with this tool from the comfort of your own home. Plus, don’t worry about feeling like you are wasting sales staff time. Blue Nile’s online tool has me wishing I was in need of another wedding band. Then I could swoon over another pretty wedding ring! Thank you for an informative article, I’m going to share this one with my fiance. We’ve been discussing this problem for days without any clear direction. I didn’t know that some jewelry stores offer matching bridal sets that include the engagement ring and the wedding band. My husband and I have been trying to find a place to get my engagement ring. That would be great if we can get both rings at the same time. We will have to look around for a place that could do that.